For the commodore, see Matthew C. Perry. Matthew Langford Perry (born August 19, 1969) is a Golden Globe and Emmy nominated American-Canadian movie and television actor. 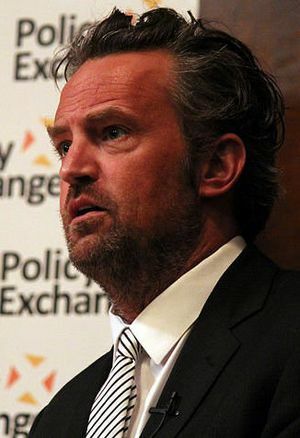 He is best known for his work as Chandler Bing in the sitcom Friends. Matthew Perry was born in Williamstown, Massachusetts. His mother, Suzanne Jane Louise Morrison (née Langford), is a Canadian journalist and was a press secretary to Canadian Prime Minister Pierre Trudeau, and his father, John Bennett Perry, is an American actor and was a model. Matthew Perry holds US and Canadian citizenship. He is very good at French. His parents divorced (broke-up) before his 1st birthday and his mother is re-married to Keith Morrison, a broadcast journalist. Matthew Perry was raised by his mother in Ottawa. While growing up in Ontario, Matthew Perry was very interested in tennis and started playing and soon became a top-ranked junior player (he has been good friends with professional tennis player Jennifer Capriati). The schools he went to were Rockcliffe Park Public School, Lisgar Collegiate Institute, and Ashbury College, all of which are in Ottawa, Ontario, Canada. Matthew Perry (actor) Facts for Kids. Kiddle Encyclopedia.